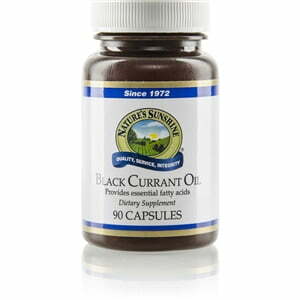 Nature’s Sunshine Black Currant Oil provides tissue protection, supports the circulatory system, and insulates nerves. Gamma-linolenic acid (GLA), a key ingredient of black currant oil, is a polyunsaturated fatty acid that assists in regulating body temperature as well as protecting nerves and tissue. Gamma-linolenic acid, in addition to the other polyunsaturated fatty acids found in black currant oil, proceed prostaglandins, essential substances for many bodily functions, including blood vessel health, proper arterial pressure, metabolization of dietary cholesterol, and activation of T-lymphocytes, among other functions. 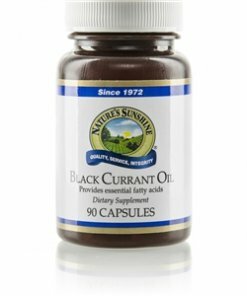 Nature’s Sunshine Black Currant Oil consists of 16 to 18 of gamma-linolenic acid or 40-45 mg. Additionally, it also includes linoleic acid, alpha-linolenic acid, and stearidonic acid, several other key fatty acids.